If you’re up for a big laugh, The Lyric will host a hilarious night out with a collection of South Africa’s top comedians all on one stage so don’t miss out! 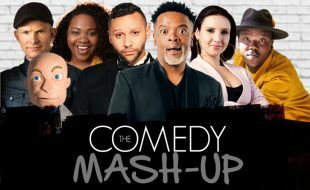 Hosted by Donovan Goliath, it includes comedy greats such as Conrad Koch (aka Chester Missing), Trevor Gumbi, Nina Hastie along with TolA$$ Mo and rising star of comedy, Lindy Johnson. From the producers of “The Big 5 Comedy Show”, Taylor Made Productions brings you their newest comedy concept. This line-up presents a celebration of SA’s diverse comedy scene. It’s a non-stop laughter fest as the comics touch on the silly, the surreal, the naughty & the nice. If laughter is the best medicine, then ‘The Comedy Mash Up’ is just what the doctor ordered.